Apr. 3, 2019: Sarah Lawrence College is delighted to announce that the Jean Wentworth Music Residency will bring the Weiss Kaplan Stumpf Trio to campus in April. Established by the Wentworth family in memory of revered concert pianist and music faculty member emerita Jean Wentworth, the residency invites musicians of distinction to campus to work with students in program areas of music and beyond, offering cross-disciplinary engagement and audience building. The trio's visit will include two free public concerts, an afternoon concert on Tuesday, April 23, at 1:30 pm, and an evening concert on Wednesday, April 24, at 7:30 pm, both in Reisinger Auditorium on the campus of the college. The concerts will feature piano trios of Beethoven, Ravel, and American composer Paul Lansky and short piano pieces from Yael Weiss’s 32 Bright Clouds project, including works by composers Malek Jandali (from Syria), Sidney Marquez Boquiren (the Philippines), George Mensah Essilfie (Ghana), and Ananda Sukarlan (Indonesia), and the world premiere of Venezuelan composer Adina Izarra’s Arietta for the 150, which is dedicated to the 150 young people whose lives were taken during the 2017 peace demonstrations in Venezuela. A renowned Debussy scholar, Jean Wentworth taught piano, chamber music, and music history at the college for more than 40 years. She was also highly respected for her performances of solo, chamber, and orchestral works, particularly works by composers Debussy, Mozart, Beethoven, Schubert, and Bartok. The Weiss Kaplan Stumpf Trio combines the talents of three award-winning soloists to bring its distinctive fusion of authority and experience, energy, and passion to each performance. Pianist Yael Weiss, violinist Mark Kaplan, and cellist Peter Stumpf make up the ensemble and embrace the music of the future while offering fresh insights into three centuries of masterworks. 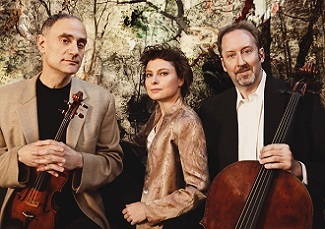 Hailed by The New York Times as “three strong voices, locked in sequence,” the trio has presented concerts throughout the U.S., Europe, and the Middle East, with appearances at the Kennedy Center, Wigmore Hall, Baltimore’s Shriver Hall, Princeton, UCLA, Indiana University, Oxford University, and the Tel-Aviv Museum and performances for the chamber music societies of Edinburgh, Santander, Pasadena, Phoenix, Cincinnati, Salt Lake City, and Tucson, among many others. The trio is well known to American radio audiences through nationwide broadcasts on shows such as APR’s Performance Today and WNYC’s Soundcheck and through its critically acclaimed recordings for Bridge Records. The ensemble has recorded the complete set of Beethoven’s piano trios, which will be released on Bridge in honor of the Beethoven 250th anniversary in 2020. Committed to new music, the Weiss Kaplan Stumpf Trio has commissioned many works, including Lera Auerbach’s Triptych: The Mirror with Three Faces, Clancy Newman’s Juxt-Opposition, and Variations on a Poem by Michael Hersch. In 2015, the trio gave the world premiere of Michael Gilbertson’s concerto for trio and orchestra, Outliers, and in 2018 recorded Angles, a new work written for the trio by noted composer Paul Lansky, which will be performed on the April 23 concert. To register for the Weiss Kaplan Stumpf Trio free concerts on April 23 and 24, please contact CLOAKING .